Advances in glass technology have paralleled the development of modern medicine since Anton van Leeuwenhoek's breakthroughs in optical lenses and microscopes in the 17th century began to unravel the mysteries of blood flow, yeasts, and the how small parasites can affect human health. Glass instruments in medical science are directly or indirectly responsible for a substantial number of the improvements the world has seen in health and health care, and glass participates in forwarding expansion of the human lifespan. Just how indispensible the material is to the medical field is brought home in an exhibition currently on view at the International Museum of Surgical Science in Chicago, a great detour for those in town for the big SOFA art fair this weekend. The GLASS Quarterly Hot Sheet recently interviewed Collin Pressler, curator at IMSS, to discuss the museum’s take on how glass is both an historical and aesthetic display of beauty and purpose. GLASS: What can you tell me about how glass figures into the exhibitions currently on view? Collin Pressler: The Museum currently displays a large volume of its permanent collection of antique medical paraphernalia, rare manuscripts, and works of art across 22 medically thematized exhibitions, of which 2 are committed to contemporary art and artists. 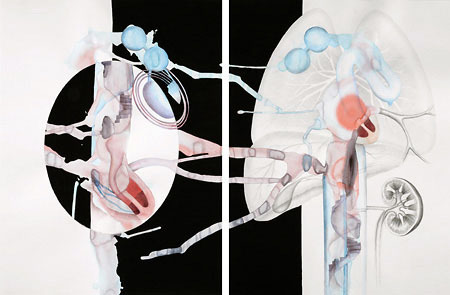 In “Synaesthetica,” Chicago based artist Stevie Hanley investigates sense experience at the borderlands of biological/scientific and artistic discourses. In “4th Floor North: A History Lab,” Chicago based artists Vesna Jovanovic, Ryan M. Pfeiffer and Rebecca Walz excavate the Museum’s collection as conceptual fodder for their own work. 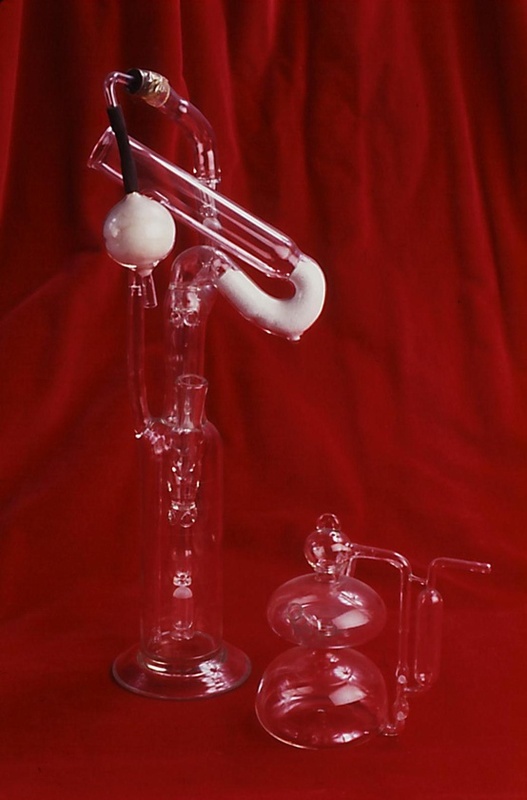 Jovanovic, who has worked off the Museum’s collection since 2013, spent a number of months working with the “Lindbergh/Carrel Perfusion Pump,” an elegant spindle of glass and gaskets used in the early 20th century to facilitate the first scientific ventures into “extracorporeal circulation,” or the movement and oxygenation of blood outside the body. GLASS: Are there any specific glass works on display? Tell me about them. Collin: The Museum displays a remarkable number of antique x-ray tubes in its “Milestones in Medical Imaging” exhibit. Like the “Lindbergh/Carrel Perfusion Pump,” displayed alongside inkspill drawings by Vesna Jovanovic, the glass instruments in the Museum’s collection have a scientific significance as well as an aesthetic resonance. GLASS: How is glass presented in the museum? Collin: In two principal ways: (1) as part of the material history of medicine, facilitating a number of sensitive or sophisticated procedures - often those requiring sterile environments (expressed in the ostensible material “purity” of glass), and (2) as aesthetic objects that resonate across conceptual platforms: as objects of beauty, as objects that tether social and personal histories, etc. 1524 N. Lake Shore Dr.